The ShowEnds command opens the End Analysis control and displays the endpoints of curves. Points display on the object. Right-click once to set one option and clear all others. Right-click twice to set all options. Displays a point display marker at the start of open curves. Displays a point display marker at the end of open curves. Displays a point display marker at the seams of closed curves such as circles. Displays a point display marker at the join location of polycurve segments. Zooms to include the display marker locations. Zooms to include all end display markers. Zooms to the first end display marker in the selection. This useful if you zoom out with the mouse and want to zoom back in. Zooms to the next end display marker in the selection. If the selected objects have only one end marker, this option is not displayed. Zooms to the previous end display marker in the selection. If the selected objects have only one end marker, this option is not displayed. Marks the ends with point objects. If the All option was previously selected, all ends are marked. Set the display color for the display markers. Add objects to the End Analysis display. Remove objects from the End Analysis display. The ShowEndsOff command closes the End Analysis control and turns off end display points. The ZoomEnds command finds and marks curve ends in End Analysis. Run the ShowEnds command to display curve ends. Click the Zoom button in the End Analysis dialog, or run the ZoomEnds command. 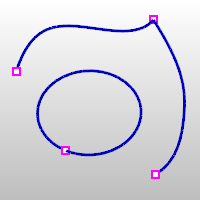 The active viewport zooms to show all the curve ends.